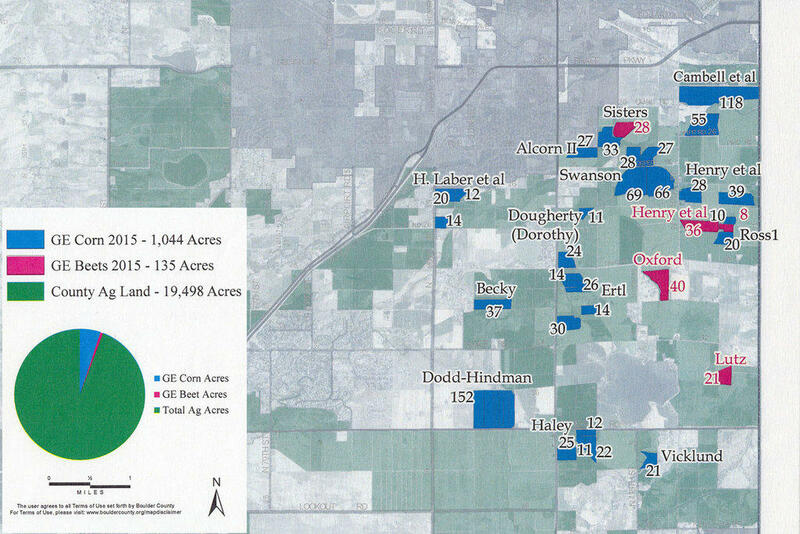 Genetically-engineered sugar beets covered 135 acres of publicly-owned open space land in Boulder County in 2015. If you want a front row seat to the fight over GMOs head to Boulder County, Colorado. GMOs, or more precisely, genetically-engineered crops, are lightning rods in discussions of our food. For the farmers who grow them and the scientists who create them, they’re a wonder of technology. For those opposed, the plants represent all that’s wrong with modern agriculture. That theater is playing out in Boulder County, where an elected board of commissioners is considering whether to pull the plants off large swathes of publicly-owned land. “The fundamental of this discussion is that this is land that’s owned by the public,” says Ron Stewart, director of Boulder County’s Parks and Open Space Department. Since the 1970s, the county has been aggressive in its land acquisition, an effort to prevent urban sprawl and preserve agricultural lands. The county buys farms and leases the land back to farmers. All told, the county manages more than 100,000 acres of pasture, forest trails and farms. Of that land, about 1 percent is planted with GMO corn and sugar beets every year. Farmers raised 1,044 acres of genetically-engineered corn and 135 acres of genetically-engineered sugar beets on Boulder County open space in 2015. Boulder County serves as a microcosm for the larger national, and international, debate about genetic engineering in agriculture. Conventional farmland butts up against headquarters for some of the most recognized organic food brands in the country. It’s home to some of the most prestigious scientific organizations in the world. The city of Boulder serves as a hub of alternative and homeopathic medicine. The county’s farmland is a small island in the middle of rapidly expanding urban development. Those urban dwellers are more than willing to voice how they think farming on public land should be done. That puts the conventional farmers who lease public land in a unique position. "Two of these county commissioners ran on a platform to ban GMOs. It is why I supported them." After county commissioners made it clear they’d be revisiting the county’s cropland policy in 2016, factions of proponents and opponents organized. The last time commissioners voted to allow GMO cultivation on county open space in 2011, it was unanimous. Five years later, two first-term commissioners, Elise Jones and Deb Gardner — who both declined to comment for this story — are creating a new dynamic. Both voiced a desire to move away from GMO crops on county-owned land when they were campaigning in 2012. On a three-person commission, two votes makes a majority. Those kinds of campaign promises are emboldening community activists like independent health consultant Mary Smith and natural food marketer Steven Hoffman. Natural food marketer Steven Hoffman is organizing to persuade Boulder County commissioners to ban cultivation of GMOs on public open space. “Instead they are being mined by conventional agriculture for commodity crops that are sent outside this community,” she says. Smith and Hoffman list their concerns that stem from GMO cultivation on Boulder County’s public land. They lament organic farmers struggling to compete, agrichemical companies amassing economic power, and pesticides seeping into streams. All of those are issues in their own right, but they’re more tangentially tied to seeds that have been genetically engineered, not necessarily a direct result of the 1,000 acres of GMO corn and sugar beets on county open space. As the conversation goes on we end up further away from GMOs altogether. When we think we’re talking about GMOs, are we really talking about them at all? "It's true that GMOs have become symbolic of something much larger. And I don't think they're a very good symbol at that." GMOs are a physical, tangible manifestation of a much larger set of economic and political concerns, something Will Toor, a former Boulder County commissioner, knows firsthand. He sat on the board the last time this issue came up. “I certainly think it’s true that GMOs have become symbolic of something much larger,” Toor says. Toor was the mayor of Boulder when the city’s leaders banned GMO cultivation on publicly-owned land, what he calls a symbolic gesture as the city’s property included few parcels appropriate for crop production. When the issue came up during his tenure as commissioner he decided to study up. The intense focus on genetic engineering misses the point, Toor says. He’d rather see people organizing for better water efficiency, soil health and adaptation to climate change. “Those are the interesting questions, and they have almost nothing to do with GMO or non-GMO or even organic and non-organic,” he says. Longmont farmers Famuer Rasmussen (left) and Jules Van Thuyne lease Boulder County open space land. Farmers Jules Van Thuyne and Famuer Rasmussen lease some of the county’s land to grow GMO corn and sugar beets. They also include malt barley and wheat in their annual crop rotations. For them, the crops are more than a symbol. The plants are another tool in a toolbox to raise a profitable crop, Rasmussen says. "These aren't corporate farms. These are farm families that have been here for several generations whose livelihood is very much affected by this decision." “We have a win-win situation where we help [the Parks and Open Space Department] maintain their ground and it gives us an opportunity to do what we really enjoy making a living at, and that’s farming,” he says. Because of certain contractual obligations, and the realities of the market for sugar beets, Van Thuyne says a ban on GMOs would upend his operations. He’s not even sure he’d be able to secure conventionally-bred seed to comply. “These aren’t corporate farms. These are farm families that have been here for several generations whose livelihood is very much affected by this decision,” Van Thuyne says. Ultimately, what happens to 1,000 acres of farmland on Colorado’s Front Range won’t tip the scales in the much larger national debate about GMOs. But it could speak volumes about how elected officials interpret science, and how deep the divide is between urban and rural communities. After the patent on one of the most popular versions of genetically engineered soybeans expired this year, U.S. universities are creating new generic GMO soybean varieties, many of which are designed to guard against specific, local pests. Ninety percent of soybean seeds planted in the U.S. are genetically engineered to withstand herbicides. Often that’s glyphosate, the weed-whacking ingredient in Roundup, developed by the behemoth seed company Monsanto. The glyphosate-resistant trait transformed U.S. agriculture when the first generation of Roundup was introduced. Twenty years later, the patent for that technology has expired, leaving the door open for universities to run with the technology and layer seeds with more protections. A kind of salmon that's been genetically modified so that it grows faster may be on the way to a supermarket near you. The Food and Drug Administration approved the fish on Thursday — a decision that environmental and food-safety groups are vowing to fight. Breaking up is a hard thing to do. It’s even harder when you’re a publicly traded, multinational seed or chemical conglomerate. Monsanto, the St. Louis-based seed company that produces the widely-used herbicide RoundUp, had to learn that lesson the hard way. The world’s largest seed company announced Wednesday that after months of wooing, it’s no longer pursuing Switzerland-based Syngenta, the world’s largest producer of farm chemicals. Chipotle Mexican Grill has completed a task that remained elusive for years: removing all food products derived from genetically engineered crops from its menu. The Denver-based company is the first national restaurant chain to make the change. Nothing conjures bucolic, pastoral farm imagery like a group of kids singing along to “Old MacDonald Had A Farm.” You know the words: He has a farm and on that farm he has some animals. E-I-E-I-O. The nursery rhyme is iconic. It rouses a certain kind of nostalgia. Tamper with the formula to stir up some emotions, and you’re begging for a slugfest.